A classic fragrant flowering shrub Gardenia augusta with its white flowers is a wonderful landscaping plant. The attractive fragrance is also appreciated indoors, so this great plant doubles up as source of cut flowers. The secret to growing Gardenia august is creating a warm frost free position, this along with good humus rich soil will ensure great flowers. It is the many cultivars that are sought after, some very low growing and suited for use as border plants, or for growing in containers. The larger types make impressive features plants in the garden. 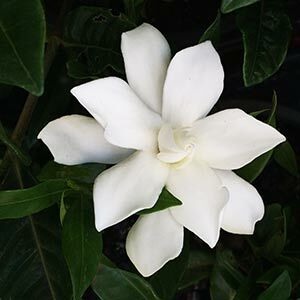 An evergreen shrub Gardenia augusta is grown mainly for the fragrant ivory white flowers produced from late spring to summer, and is also used as a hedging plant. Slow to moderate in growth rate over time gardenia augusta will reach around 2m (6ft) depending on cultivar. Green glossy foliage year round is an added feature. Forming a dense bush Gardenia augusta is well suited to full sun to part shade and is drought tolerant once established. It does not like frosts and the foliage will ‘burn’ in cold conditions. A number of cultivars are available including some dwarf varieties. Try planting Gardenia augusta near a doorway or window, where the perfume on a warm night can be allowed to waft through the house. Also excellent near outdoor entertaining areas. Position – Full sun in a warm sheltered position. Soil – Humus rich, moist and well drained. A slightly acid soil is best. Fertilizer – Use a specialist gardenia fertiliser, such as Harry Gardenia Food for best results. Apply in spring and again in early summer. In container use a premium potting mix with some well rotted compost added in. Most Gardenia augusta cultivars are warm climate plants, so those in the cooler sates will need to find a warm sunny position. The cultivar ‘Florida’ with its double white flowers is very popular in Australia, not a tall growing plant to around 1m only. Excellent as a low hedging plant or as a flowering feature in the garden border. G. augusta magnifica is a taller growing cultivar to nearly 2m. G. augusta florida – Reaches around 1.2m in height with a spread of 1.4m plus. Excellent container plant. G. augusta magnifica ‘Golden magic’ is slightly lower growing. G. augusta ‘Professor Pucci’ will reach around 1.2 m in height with a similar spread. Where can you buy Gardenia augusta?